Strawberry Hill House, often referred to simply as Strawberry Hill, is the Gothic Revival villa that was built in Twickenham, London by Horace Walpole from 1749. 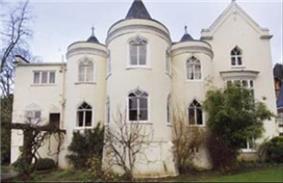 It is the type example of the "Strawberry Hill Gothic" style of architecture, and it prefigured the nineteenth-century Gothic revival. Walpole rebuilt the existing house in stages starting in 1749, 1760, 1772 and 1776. These added gothic features such as towers and battlements outside and elaborate decoration inside to create "gloomth" to suit Walpole's collection of antiquarian objects, contrasting with the more cheerful or "riant" garden. 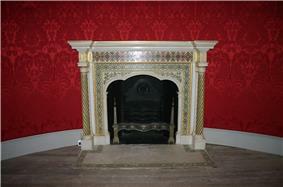 The interior included a Robert Adam fireplace; parts of the exterior were designed by James Essex. The garden contained a large seat shaped like a Rococo sea shell; it has been recreated in the 2012 restoration. In May 1747 Horace Walpole took a lease on a small 17th-century house that was "little more than a cottage", with 5 acres (20,000 m2) of land from a Mrs. Chenevix. The following year he purchased the house which the original owner, a coachman, had named "Chopped Straw Hall". This was intolerable to Walpole, "his residence ought, he thought, to possess some distinctive appellation; of a very different character..." Finding an old lease that described his land as "Strawberry Hill Shot", Walpole adopted this new name for his soon to be "elegant villa". From "On Modern Gardening": "The fairest scenes, that depend on themselves alone, weary when often seen. The Doric portico, the Palladian bridge, the Gothic ruin, the Chinese pagoda, that surprise the stranger, soon lose their charms to their surfeited master. But the ornament whose merit soonest fades, is the hermitage, or scene adapted to contemplation. It is almost comic to set aside a quarter of one's garden to be melancholy in." Here, Walpole's separation of style between his house and grounds can be seen. A friend, Horace Mann, assumed that Walpole's garden would be similarly Gothic. 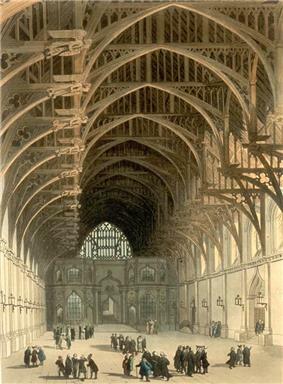 Walpole responded "Gothic is merely architecture, and as one has a satisfaction in imprinting the gloomth of abbeys and cathedrals on one's house, so one's garden, on the contrary, is to be nothing but riant, and the gaiety of nature". In a letter to Horace Mann in 1763, Walpole complained: "I have but a minute's time in answering your letter, my house is full of people, and has been so from the instant I breakfasted, and more are coming; in short, I keep an inn; the sign 'The Gothic Castle' ...my whole time is passed in giving tickets for seeing it, and hiding myself when it is seen. Take my advice, never build a charming house for yourself between London and Hampton-court: everybody will live in it but you". Warburton notes that while Walpole may have been annoyed from time to time, he also came to see his estate contributing to the public's enjoyment when he had doubts about his endeavour. "He arrives at the conclusion that all he has done is for the benefit of others rather than for himself". After the death of Walpole, the house passed first to his cousin  In 1923 it was bought by St Mary's University, Twickenham. The collection at Horace Walpole's Strawberry Hill was featured at the Victoria & Albert Museum from March to July 2010 to prepare for the opening of the house to the public that October. Curator of the exhibition Michael Snodin sees Walpole as an influential figure in both collection and architecture: "he created a form of thematised historical display which prefigured modern museums. 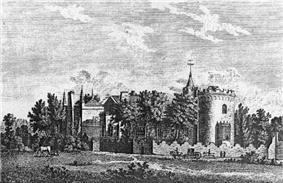 And Strawberry Hill was the most influential building of the early Gothic revival". After a £9 million, two-year-long restoration, Strawberry Hill House reopened to the public on Saturday 2 October 2010. In 2013 Strawberry Hill House was one of two London landmarks to win the European Union Prize for Cultural Heritage in the Europa Nostra Awards. ^ a b c Kennedy, Maev (12 September 2010). "Strawberry Hill will open doors to public once again". The Guardian. Retrieved 2013-01-15. ^ Hill, Rosemary, "Welcome to Strawberry Hill: Chronology and Architecture at the Service of Horace Walpole". Times Literary Supplement, May 19, 2010. ^ a b "Horace Walpole's Strawberry Hill Collection". The Lewis Walpole Library, Yale University. 28 March 2011. ^ "Strawberry Hill House - The Garden". The Strawberry Hill Trust. Retrieved 2013-01-15. ^ "St Mary’s University College". The Strawberry Hill Trust. Retrieved 2013-01-15. ^ "Strawberry Hill - History". The Strawberry Hill Trust. Retrieved 2013-01-15. ^ Vickery, Amanda. 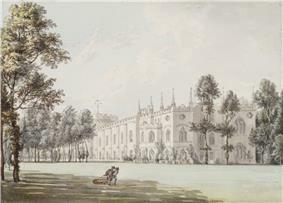 "Horace Walpole and Strawberry Hill". The Guardian. London. 20 February 2010. ^ Chambers, Ellie (25 June 2013). 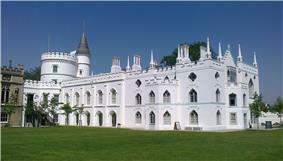 "Strawberry Hill House wins cultural heritage award". Richmond and Twickenham Times (London). 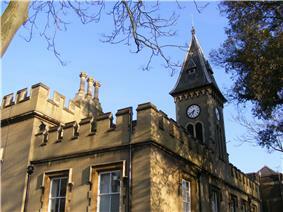 Houghton Lodge, a Gothic fishing lodge built in Strawberry Hill style in c. 1800.